Metro South Health and Brisbane South PHN are committed to supporting general practice. Resources from both organisations, together with start-up funding from the Queensland Government Department of Health, have enabled us to embrace the opportunity to deliver SpotOnHealth HealthPathways in the Brisbane South region. Partnerships with Mater Health Services and Children’s Health Queensland ensure that care pathways can be localised for a wide range of patient care needs relevant to our region. SpotOnHealth HealthPathways is being progressively localised through collaborations between general practitioners, hospital specialists, allied health and nursing providers, non-government organisations and peak bodies. The pathways on SpotOnHealth HealthPathways are kept current through continuous feedback and peer review. 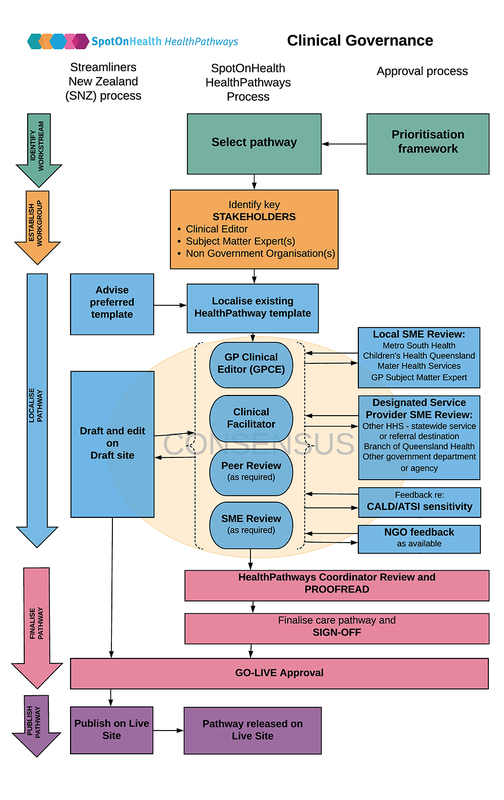 Each pathway is formally reviewed every 3 years by clinicians across primary and acute care.